Brain slugs are little parasitic slugs that attach themselves to the heads of intelligent beings (such as humans) and control them. They are about as big as a fist, green, and translucent, and have two feelers and one enormous eye. A person assimilated by a brain slug will be likely to speak in a monotone voice and do everything to further the spreading of brain slugs throughout the universe, but the easiest way to tell a person is infected is by the brain slug sitting on their head. The person assimilated retains awareness of his condition, which Hermes referred to as a "nightmare". The recommended procedure of dealing with a brain slug victim is to act natural and switch to a garlic shampoo. Another way to deny attachment is wearing a helmet. Fortunately, brain slugs are not very intelligent and can be easily removed without harming the affected person, minimizing the risk. Once removed from the afflicted person's head, the person returns immediately to normal. There is a political group known as the Brain Slug Party on Earth, naturally organized by citizens of Earth with brain slugs attached to them. Its political goals include awarding unreasonably high subsidies to the Brain Slug Planet and attaching brain slugs to "the working man"- and basically everyone else on Earth. Two employees of Planet Express have had experience with brain slugs. Hermes was afflicted in "A Head in the Polls", and again in "Raging Bender" when he managed to infect Fry. In Fry's case, the brain slug died of starvation shortly after attaching to his head. This raises interesting questions about whether the brain slugs feed on the victim's Delta Brain Wave to survive, for Fry lacks this particular wave form. [3ACV07] However, it is also possible that Fry is just an idiot and lacks the mental energy to sustain an adult brain slug. In the first comic of the series, the Slug-O-Vac removes a brain slug from Fry's brain, which would debunk previous theories as Fry had been affected. The non-canon status of the comics makes Fry's ability to be assimilated uncertain. In the game, Hermes is again infected. Brain slugs are sometimes used by the writers of Futurama to poke fun at the show itself. 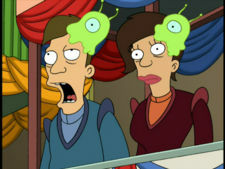 For example, during scenes which serve little purpose other than to be entertaining, Futurama will often cut to a shot of a character with a brain slug attached. On these occasions, the unexpected appearance of a brain slug serves as a metaphor for television made simply to entertain, with no real cerebral content to offer the audience. Brain slugs represent the effects of watching TV passively during scenes that require no active, critical thought on the part of the viewer. The use of this plot device can be seen in "Raging Bender" when the show cuts from a sensationalized fight scene to the recently-assimilated Hermes and Fry, who are watching the fight blankly. On the audio commentary for "Raging Bender", David X. Cohen states that the brain slugs were initially planned to fulfil a different, larger role. They would have hung on ceilings and dropped on the heads of people, making them smarter for a time, but ultimately covering their entire heads. A brain-slug-like hat is featured in Valve's Team Fortress 2 and is named Triboniophorus Tyrannus after a green Australian native bug. A Team Fortress 2 player "SUNSPY" has collected all 26 "Unusual" effects of the Triboniophorus Tyrannus (brain slug). Their home planet is located in the "Spleef" nebula or possibly somewhere between there and Earth. Hermes: [monotonous] The flight had a stopover on the Brain Slug Planet. Hermes liked it so much he decided to stay of his own free will. Fry: Hermes has all the fun! Fry: Wow! Thanks, Hermes! [He raises it to his head.] I-- Hey! Cut that out! Hermes: [After Bender knocks the slug off Hermes head.] Thank God I'm free of that nightmare! Hermes: [monotonous] Thank you. It was cold down there on the floor. Hermes: [monotonous] On to new business. Today's mission is for all of you to go to the Brain Slug Planet. Zoidberg: What do we do there? Hermes: [monotonous] Just walk around not wearing a helmet. This page was last edited on 19 March 2017, at 06:31.